RIE parenting could be summed up as an awareness of our babies. We perceive and acknowledge them to be unique, separate people. We enhance our awareness by observing them — allowing them the bit of space they need to show us who they are and what they need. RIE parenting also makes us more self-aware. 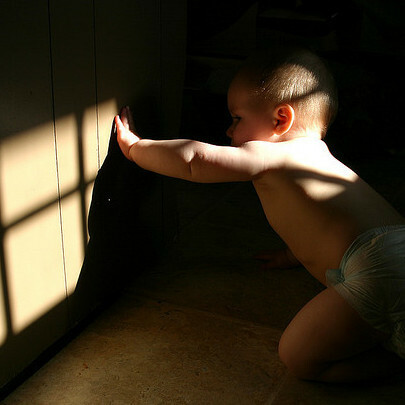 Through our sensitive observations we learn not to jump to conclusions; for example, that our babies are bored, tired, cold, hungry, or want to hold the toy they seem to notice across the room. We learn not to assume that grumbling or fussing means babies need to be propped to sitting, picked up, or rocked or bounced to sleep. We recognize that, like us, babies sometimes have feelings that they want to share and will work through them in their own way with our support. We learn to differentiate our children’s signals from our own projections. We become more aware of the habits we create (like sitting babies up or bouncing them to sleep), habits that can then become our child’s needs. These are artificially created needs rather than organic ones. In short, RIE parenting asks us to use our minds as well as our instinct, to look and listen closely and carefully before we respond. Practiced observers like RIE founder Magda Gerber weren’t wrong. More than sixty years ago, Gerber and her mentor, pediatrician Emmi Pikler, knew what Gopnik’s research is finally now proving: infants are born with phenomenal learning abilities, unique gifts, deep thoughts and emotions. Pikler and Gerber dismissed the notion of babies as “cute blobs” years ago, understood them as whole people deserving of our respect. 1. We communicate authentically. 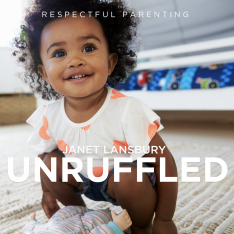 We speak in our authentic voices (though a bit more slowly with babies and toddlers), use real words and talk about real things, especially things that directly pertain to our babies and that are happening now. We encourage babies to build communication skills by asking them questions, affording them plenty of time to respond, always acknowledging their communication. 2. We invite babies to actively participate in caregiving activities like diapering, bathing, meals and bedtime rituals and give them our full attention during these activities. This inclusion and focused attention nurtures our parent-child relationship, providing children the sense of security they need to be able to separate and engage in self-directed play. 3. We encourage uninterrupted, self-directed play by offering even the youngest infants free play opportunities, sensitively observing so as not to needlessly interrupt, and trusting that our child’s play choices are enough. Perfect, actually. 4. We allow children to develop motor and cognitive skills naturally according to their innate timetables by offering them free play and movement opportunities in an enriching environment, rather than teaching, restricting or otherwise interfering with these organic processes. Our role in development is primarily trust. 5. We value intrinsic motivation and inner-directedness, so we acknowledge effort and take care not to over-praise. We trust our children to know themselves better than we know them, so we allow children to lead when they play and choose enrichment activities, rather than projecting our own interests. We encourage our children’s passions and support them to fulfill their dreams. 6. We encourage children to express their emotions by openly accepting and acknowledging them. 7. We recognize that children need confident, empathic leaders and clear boundaries, but not shaming, distractions, punishments or time out. 8. We allow children to problem-solve and experience and learn from age-appropriate conflicts with our support. 9. We understand the power of our modeling and recognize that our children are learning from us through our every word and action about love, relationships, empathy, generosity, gratitude, patience, tolerance, kindness, honesty and respect. Most profoundly, they’re learning about themselves, their abilities and their worth, their place in our hearts and in the world. Note: these are not Magda Gerber’s official RIE principles (which are found HERE). The outcome of all this? I couldn’t agree more with the promises Magda Gerber stated: “RIE helps adults raise children who are competent, confident, curious, attentive, exploring, cooperative, secure, peaceful, focused, self-initiating, resourceful, involved, inner-directed, aware and interested”. 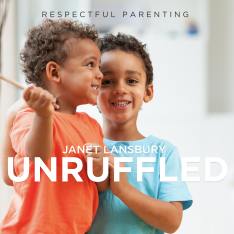 In these two podcast episodes (from my series “Unruffled”) I share more about the first 6 parenting basics. The final installment in which I’ll describe basics 7,8, and 9 is coming soon! A simple hearty huge THANK YOU for this clear concise post!!! Excellent! My pleasure, Sherra! Thank you! It would be great if you could give some real situation examples if each? Thank you! Hi Andy! In the opening sentence of each of the bullet points there are links to posts with specific examples. For most of these topics I written many, many posts, so you might want to check out the drop-down under “Parenting” on my toolbar, or use my search function or tag cloud. Thank you Janet – the timing of this post couldn’t be better as my Bradwell Baby Cottage group is gaining ground! An exciting time for me. Sometimes I think you’re a mind reader with your posts! I’ve been reading up a lot about the RIE approach and am now thinking I could apply this at home. My son was in an unfortunate position as a young child for which I left his father when he was 2 for domestic abuse. He would act out and lash out and would get very upset around strangers. He was diagnosed with apraxia of speech and attended a language school until 2015. This is no longer the case. He has become a confident little person amoung the family & community. He has a love of science, maths & being outdoors on bikes etc. My son is seven now and for the most part things are great. However I am hearing the You Must do this… or No we are going to do this… and while I am firm in my resolve and he knows this and does as he has been asked it is sometimes difficult. He also does this with his grandmother. My biggest concern is when he is angry or upset about something as while he doesn’t act out physically he is verbally aggressive. When someone cuts us off in the car he shouts & says they should have their licence removed or be chained and put in jail. I try to explain that people make mistakes. When he’s watching kids programs & someone hurts an animal he gets super angry again saying things that are violent. On occasion he has said things like stab them in the heart. I am happy that he feels so passionate about animals & wildlife but am concerned that what he’s saying is so violent and I don’t know if it’s something he will grow out of or if there’s strategies I can use to help him calm some of this anger he feels inside or if he will need more help from someone other than me. I am also encouraging more independence as until recently he has still gotten upset unless I sit at his door at bedtime. This finally seems to be happing less regularly. I also seem to be recieving a lot of attitude, which I figure may just be a stage. He is not having contact with his father & this is still an ongoing process. Please let me know what you think or can suggest. In my music practice, many parents bring with them a pressure to perform or make their babies perform. That assumed pressure sometimes tempts them to fill in the gaps for their babies. To relieve this, I like to encourage “purposeful silence” where the parents listen delightedly, with no expectations, even if the baby makes no sound at all. Thanks for the reminder that this is a basic communication skill! I love the “purposeful silence”, Ekanem. It sounds like our “quiet observation time” in RIE Parenting classes. This is perfect. I usually don’t bother to direct people here unless they’re looking for advice on specific things like independent play or clingy babies… It’s too hard to explain and usually a single post doesn’t necessarily give a good idea of what it’s “about.” Could you permi-link this in your sidebar? Thanks, Meagan, that’s a good idea… I’ll ask my webmaster. Janet, I can hear my mothers voice when I read your blog. Your understanding and ability to clearly express Magda Gerber’s ideas is paramount. The amazing children you have raised are as lucky as I am. Clear and kind words of this and your other blogs read by your huge list of followers does more to spread my mothers wisdom than anything or anyone else. I am forever grateful to you. Wow, that is the highest compliment, Bence, thank you! Sharing the extraordinary, life-changing gifts your mother gave me is my goal. Feels like my mission in life. Thank you janet. Thanks a million! I work with infant and toddlers and their parents. This is such a great guide. A lot of hobg kong Chinese are beginning to come around to RIE. I will be directing them to your page too. What adifference we can make in the lives of many families here! I am just learning about RIE and this post is extremely helpful to me. My daughter is 6 months old and I made the mistake of jiggling her around to soothe her. Now, she won’t take rest on me. She has learned that when she’s with me, she should be bounced or moved about in some way. Interestingly, she snuggles with her nanny with no problems. Any suggestions on how I can break the pattern I created? Babies are able to make these kinds of changes with us, as long as we communicate clearly and support them through the transition, allowing them to express feelings like, “I want it the old way!” They have the right! Our confidence, clarity, communication, and acceptance of our children’s feelings are essential to making respectful adjustments. I would consider how you want sleep to go, and then make a gradual change toward that, beginning by doing a little “less” than you are doing. Which of Magda Gerber’s two books you recommend is the better to introduce to new parents who aren’t already familiar with these ideas? Dear Parents or Your Self-Confident Baby? I recommend either of those books, Jennie. Dear Parent has more of Magda’s “voice”. Your Self-Confident Baby is a bit more comprehensive and includes several parents’ reflections. what does RIE stand for? I’m so glad to hear that. Your perspective is shared by many of us here. Welcome! Janet, Wonderful, as always. I would love to see you share the Sensory Awareness Bulletin on Emmi Pikler as a resource. As far as I know, it’s the English language publication that has the most material translated directly from Pikler’s writings. I love it. Great post! We do most of these things but we have gotten into the habit of talking in a different tone to our daughter. As much as it comes out of affection, I want her to feel respected. Do you think she will react negatively if we stopped? Remember that babies are ultra-aware and hear the way their parents speak to each other and everyone else, so it won’t be new for her…it will just be different from what’s usually directed towards her. I appreciate learning new approaches so much, and am grateful that some of these things my husband and I have done naturally. However, I am always overwhelmed with almost paralyzing guilt when I learn of something that I could have done much better in in an area that my children had already passed. Are these feelings normal? How do I overcome them? Janet, I am a Service Coordinator for an Early Intervention program in Missouri called First Steps. I have been reading your Facebook page for about a year and have found information that I can use with the parents that I serve. I am curious, though, and want to know if RIE Parenting can be done with all children with special needs since these children might not know how to do something and may need to be taught. I think the core of RIE is respect and sensitive observation which can be applied to anyone. Just enough help will be different to each child but the principle still applies. When my step mom was in hospice I was pleasantly surprised at how much my RIE practice helped me communicate and slow down with her and how much peace it gave her to be treated with respect and some dignity. It seems to me the practice of RIE is applicable to most personal interactions we have. I’m new to RIE and this post is exactly what I was looking for. I’ve been practicing AP since birth and this looks the right complement. Im struggling at moment with my 2.5yo son who seems no longer able to do anything without me and I’m getting increasingly frustrated, as I can’t literally turn my back to him 10 seconds or make a phone call without having him screaming ‘Mummy!’ all the time. I’ve just bought your book and hope to find some answers. Thank you for this post. Thank you for the post! It is so easy and clear to understand. I wish there is a Spanish version of this so that my co workers who are mainly Hispanics can understand 🙂 does anyone know rie articles in Spanish? 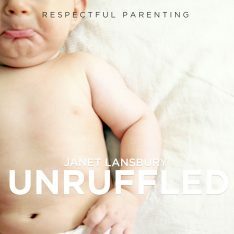 Janet I really like your respectful approach on babies/toddlers/children naturally unfolding development. It pairs really well with the vipassana meditation technique I learnt : Nature will do its own role, your job is to observe .. very grateful my midwife led me to you. have a beautiful X-mas holiday! I feel like I did really well with this approach when I had my first baby (now 2.5yo, a very spirited, sensitive and articulate boy)- I didn’t know what it was but when I read this I identified a lot that I did naturally. However with my second (11 months old) I am finding nearly impossible to really observe and understand her, simply because my toddler is so busy and takes up so much of my attention. My second baby is more content and calm by nature and because of this I feel like I pay her hardly any attention some days. Do you have any suggestions as to how to ‘juggle’ two children of different ages and personality types? I do not like feeling as though I am neglecting my second simply because she is less demanding. I am so inspired by your blog! This perspective is so simple and so brilliant and SO NEEDED in the current parenting world! I live in an area where I would have to drive about an hour to join an RIE-inspired parenting group (which I did with my first child!). Now with my second child I have decided instead to host an RIE-like group in my home for about 5 parents and babies whom are good friends and have babies the same age (6-12 months). I am curious if you have any suggestions or support or resources that I can access to help in the process. My plan is to spend the 15-20 minute observation time and maybe if there is interest print out (or email) some reading material before each meeting to hopefully spark conversation before or after the observation time. I am sure you are busy so I will be surprised and delighted if I hear back form you! Typo in bullet point #4. . last sentence. Thanks, Janet, I’m a learning grandpa. Fixed! I can’t thank you enough, JF! I have been reading your blog for last 3 years and it has helped me immensely.